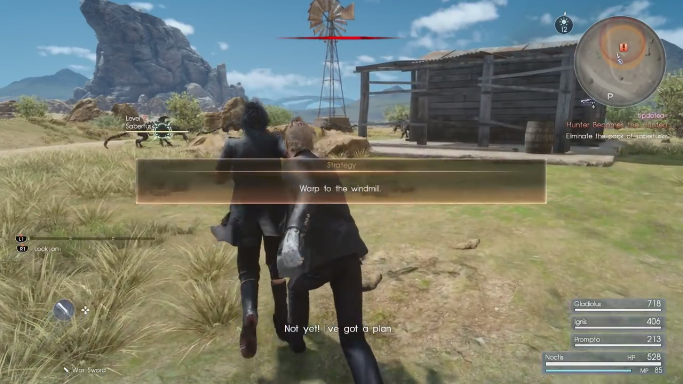 This page contains a detailed walkthrough of Chapter 1 – Departure in Final Fantasy XV, including quests, objectives, items, enemies and bosses encountered in the game. 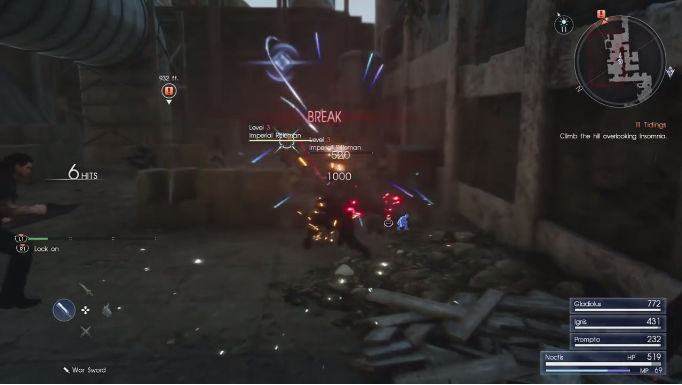 Before the start of the main storyline, the player will be given a tutorial on the basics of combat, as well as some other extra features in Final Fantasy XV. 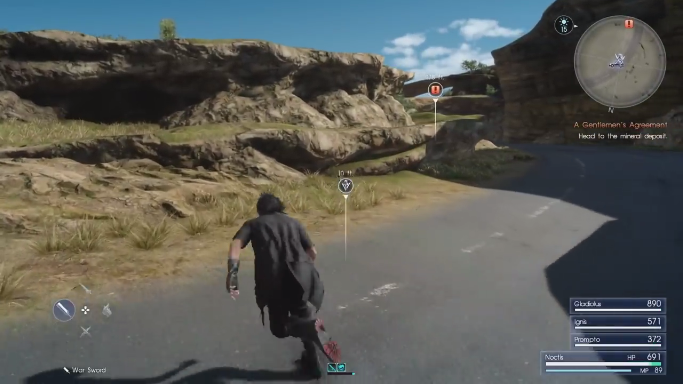 Be sure to pay attention to Carbuncle on how to maximize Noctis’ abilities! 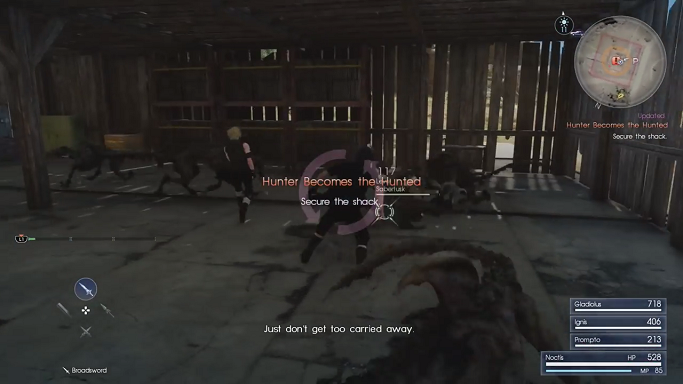 After finishing the tutorial, the game begins with a short cutscene showing an older Noctis and his party amid a sea of flames in an unknown location. The controls will immediately shift to you. Move towards the middle of the area. The game will then shift to another cutscene before the game goes back to the present timeline. 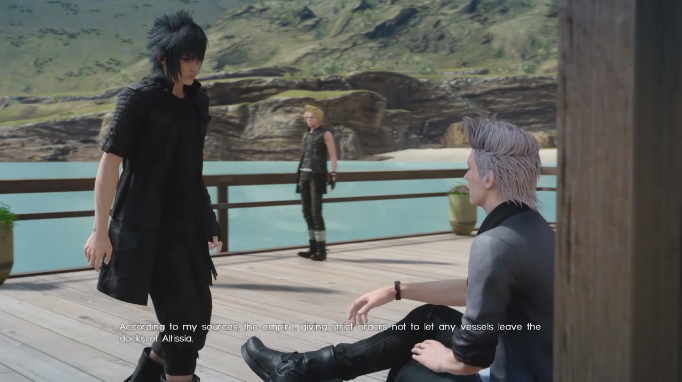 Noctis and his party (Ignis, Gladiolus and Prompto) are instructed by King Regis, Noctis’ father, to go and prepare for his wedding in Altissia, the capital city of Accordo. Unfortunately, their car breaks down in the middle of nowhere and must push it to the nearest stop on the road. Use the R2 button to push the car while the party hilariously bickers about their predicament. You can also look around by using the right analog stick. Upon arriving at the Hammerhead Outpost, the party will be greeted by Cindy, the Garage’s head mechanic. You’ll also meet Cid, the owner of the Hammerhead Garage and Cindy’s grandfather. After the cutscene, take the time to explore the outpost. Talk to Cindy and she’ll give you a World Map. You can also talk to the local tipsters to gather information related to your quest or the area you are in. You’ll find an equipment stall nearby where you can spend Gil you earn from hunting quests or selling trinkets. You can also buy stronger weapons than what your party has equipped from this shop. You can buy healing items and other consumable wares, as well as ingredients and treasures in the convenience store here. There’s also a diner called Takka’s Pit Stop where you can pick up rumors or eat food that temporarily boosts your party’s stats and other parameters. Ignis may concoct new recipes after you’ve tried different dishes in diners and restaurants. You can also go on hunts that reward you with items and Gil. Doing hunts also increases your Hunter Rank so you can take on more challenging ones. The diner attendant will also mark new areas near your current location. After a while, Ignis will tell you that you’ve exhausted the group’s funds on the car’s repair bill. You will then receive the first quest – The Pauper Prince. Talk to Cindy to begin the quest. 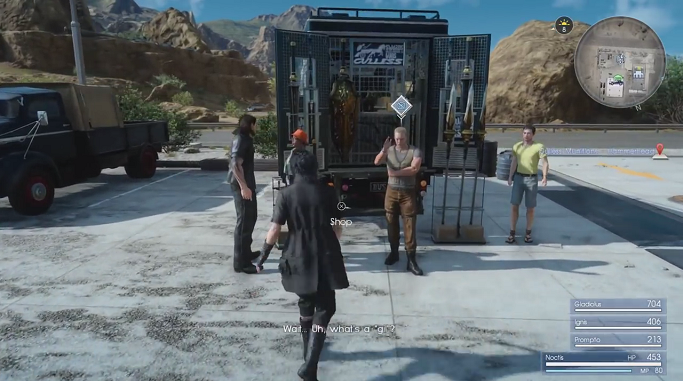 Noctis tells Cindy that the car’s repair bill is expensive, and may ask for a discount, a loan or help from his friends. 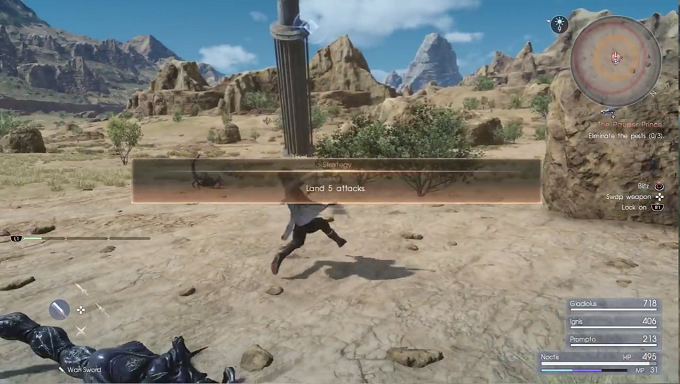 After talking to Cindy, you’ll receive 10 Ability Points (AP). You can use AP to acquire new Abilities on the Astralsphere by going to the Ascension menu. You will also receive a Bronze Bangle and 1000 Gil. Head to the location indicated by the quest marker. You will find 1x metal scrap in a bush as you leave the outpost. When you reach the first quest area, you will encounter Reapertails. You will then be given Strategies by your party members that reward a certain amount of AP if you follow them. Reapertails will drop Scorpion barbs as you take them out one by one. 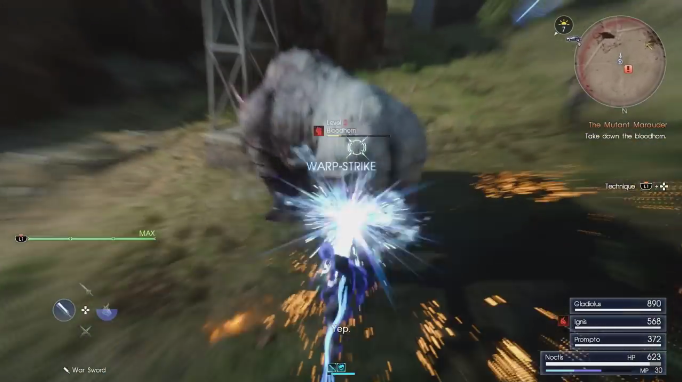 You can use warp strikes to catch enemies by surprise. Be sure to watch your MP though, since warp strikes use it up. When you run low on MP, you will enter Stasis and will not be able to phase or use warp strikes. Take cover first to regenerate MP. After clearing the three areas of Reapertails, Cindy will call you up and ask you to do another quest. Cindy will ask you to look for a guy named Dave who’s holed up in a shack nearby. Head to the shack by following the quest marker. When you enter the shack, there will be notes on the desk by the corner of the room. The notes will mention information about a mutant Dualhorn called Bloodhorn. The party will then be ambushed by a group of Sabertusks. You will need to take them all out. After that, you’ll need to continue looking for Dave. Head to the next nearby shack indicated by the quest marker. 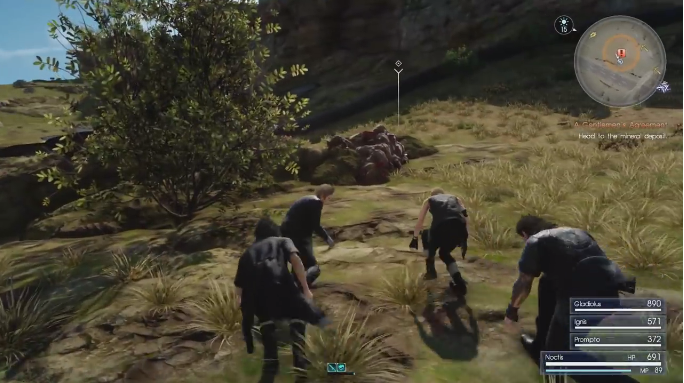 When you approach the next shack, Ignis will suggest a strategy. He will tell you to point-warp to the windmill indicated by the blue marker. Point-warping to an area above the ground quickly recovers HP and MP. 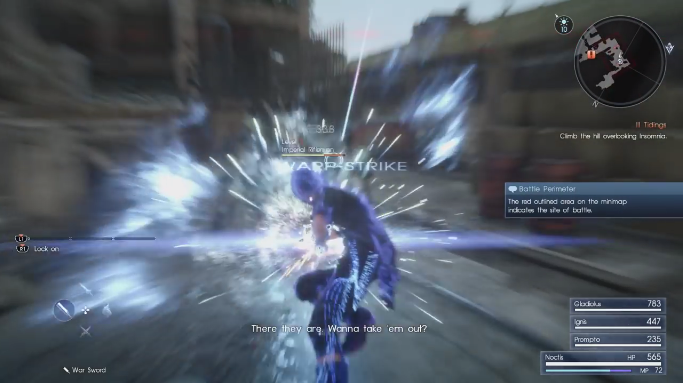 Noctis’ warp strikes will also receive a damage boost when he performs them from a hanging position. After clearing the windmill, Dave will be found inside the shack. As you speak to him, he will ask you to kill Bloodhorn. You will also obtain a 1x Magic Flask. Search around the shack and pick up a 1x Debased Coin. Head to the area indicated by the quest marker. On your way there, Ignis will suggest that you rest first at a haven before facing a formidable foe. Resting at a haven allows Ignis to cook meals that boost the party’s stats. After agreeing to rest, head to the indicated area to set up camp. Ignis can cook meals while camping by using available ingredients. Be sure to stock up on ingredients found all around Eos on your travels. Also while at camp, the experience gained during the day will be accumulated for each character to level up. The photos Prompto has taken can also be viewed so you can decide which ones to keep. After resting, head down to the area below where you made camp to find an elemental deposit for casting Elemencies. Absorb the energy from the deposit. From there, turn around and head west to find another elemental deposit. Continue following the quest marker until you reach a parking lot. There will be a big tree surrounded by ruined walls where you can find a 1x Leiden Pepper. Continue following the quest marker again. You will find a 1x Blackstone Shard or Whitestone Shard along the way. The area where you fight Bloodhorn will have two point-warp locations. It’s a good idea to start your attacks with warp strikes, then use point-warps to recover MP during the battle. Be sure to watch out for Bloodhorn occasionally charging directly at you or from the side. Generally, you’ll want to stay behind him or anywhere except in front of him for most of the fight. 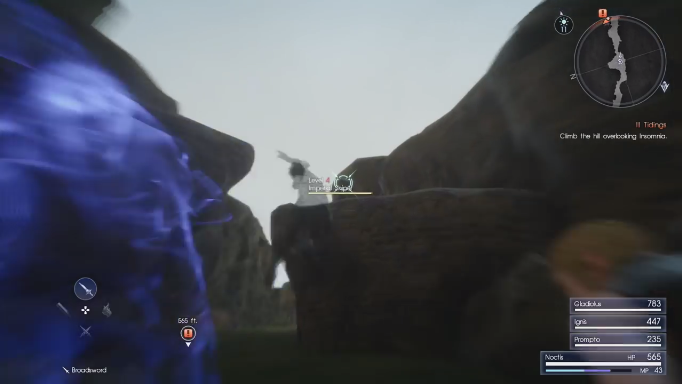 Also, you can command your allies to use Techniques for Noctis to follow up with his own attacks. After defeating Bloodhorn, you’ll obtain a 1x Red Tusk. After the fight, Cindy will call and tell you that the car has been fixed. Before leaving the area, check your map and follow the marker indicating minerals that can be harvested. You will find 2x Prismatic Dust and 1x Silver Dust. On your way back, you will also find 3x Birdbeast Eggs. Somewhere along the way back to Hammerhead outpost, a huge bird-like creature will appear, at which the party will be amazed. Talk to Cindy at the Hammerhead Garage and she’ll tell you that the car is ready to go. However, she’ll also ask you to make a delivery to a motel on your way to Galdin. Head to the motel after talking to Cindy. Upon arriving at the motel, speak to the owner at the entrance. Afterwards, Umbra will appear and give you a notebook. A cutscene will ensue showing Noctis and Luna when they were still young. Noctis will remember that they use the notebook to exchange messages. Choose a message and Umbra will deliver it to Luna. After Umbra leaves, you can explore the area. 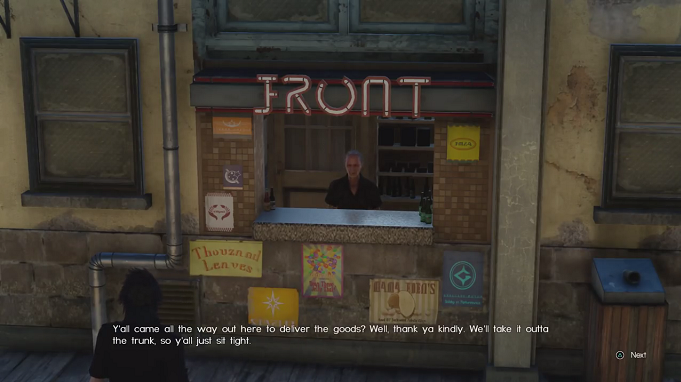 A guy in front of the motel will offer a sidequest to deliver an envelope to the Hunter HQ so you may want to do that. Otherwise, continue exploring the area. There is an item stall that sells healing items and a diner called the Crow’s Nest nearby. The diner has the same things to do as the one in Hammerhead outpost, except that this one has a Justice Monsters Five pinball machine that you can try. Head back to the car and drive to Galdin. On the road to Galdin, you can pull over and check out two elemental deposits which you can absorb. You’ll also find 3x Aegir Root and 3x Eos Green Peas nearby. Mesmenir are also roaming the area so prepare for some encounters. 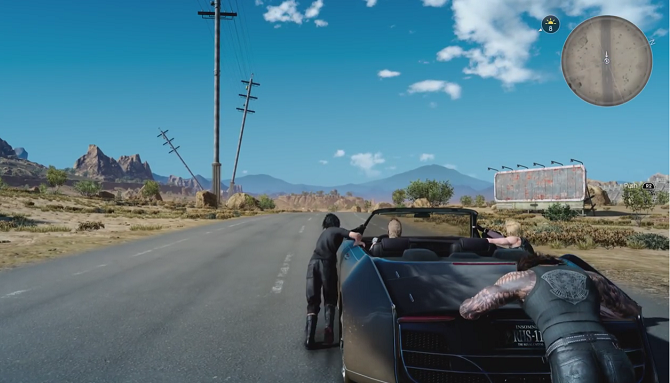 Head back to the car and continue driving to Galdin. Upon arriving there, explore the area. There will be an equipment stall to the upper right of where you parked the car. You can also talk a photo of the view of the quay by going north from the car before the stairs. From here, you can check out the bulletin board for Ignis to concoct a recipe using fish. Head north from the equipment stall to the path with street lamps that ends by the water to find 1x Hi Elixir. After you’ve explored the area, head to the area behind where you parked the car. There will be a trailer there were you can rest up and tally your EXP to level up. 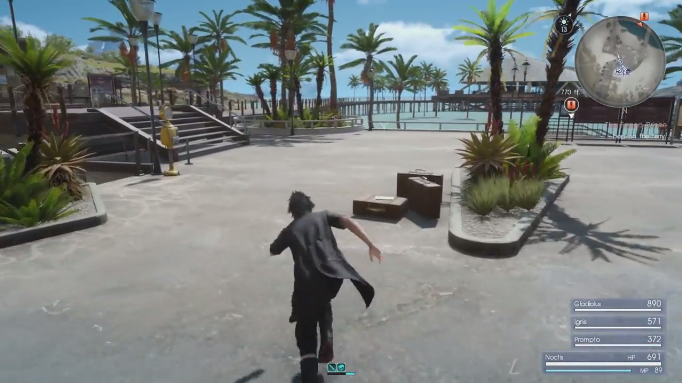 After waking up, head to the building in the center of the quay and watch the cutscene. Along the bridge, you can pick up 1x metal scrap. Upon arriving at the building, you will meet a suspicious stranger who will tell you that the boat there will not take you further. He will also give you 1x Intricate Coin. After the cutscene, explore the area. Talk to the woman at the dining counter to mark new areas, order food or hunt for monsters. From the counter, head right to find the Galdin spa, the Quayside Cradle, which has an entrance fee of 10,000 (going to the spa doubles the EXP gained in battle temporarily). From the spa entrance go south to the edge of the quay. On one of the tables, you will find 1x Oracle Ascension Coin. Head to the ship docking area. Here, the party will realize that there are no ships in sight. This concludes the Errand Prince quest. At the docks, a man named Dino who introduces himself as a reporter will talk to you. He’ll tell you that the Empire of Niflheim is holding all ships sailing to Altissia, but he knows a way to get there. He will agree to keep your travels a secret in exchange for a favor. Head to the car and drive to the mineral deposit indicated by the quest marker. The car will pull over near the location of the mineral deposit. Get on the high ground by the right of the car and follow the path. Continue following the marker and pass the bridge-like path above the road. You’ll find an area with 2x Prismatic Dust and 1x Silver Dust. 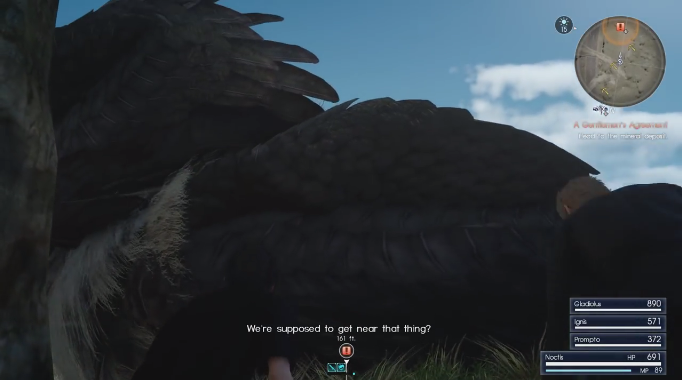 Moving forward, you will see a huge bird-like creature (similar to the one near Hammerhead outpost) resting. Carefully sneak around the giant bird and head towards the mineral deposit to get the Garnet Stone. After obtaining the stone head further and you’ll find 3x Chocobeans along the way. Head back and sneak around the bird again. It will wake up but will fly away. Before leaving the area, gather 3x Prismatic Dust from behind where the giant bird was sleeping. Head back to the car and drive back to Galdin. As you walk on the bridge leading to the central building again, there will be a cat that will initiate a sidequest which you can choose to do. 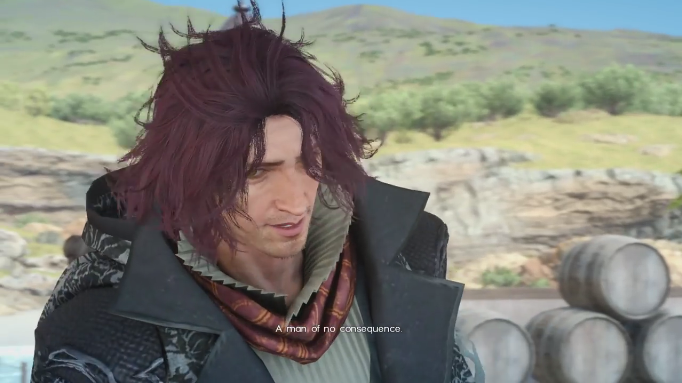 When you ask Dino about the ferry to Altissia, he’ll tell you that the ship will arrive tomorrow, so you should spend the night in Galdin again. Afterwards, a cutscene will ensue. 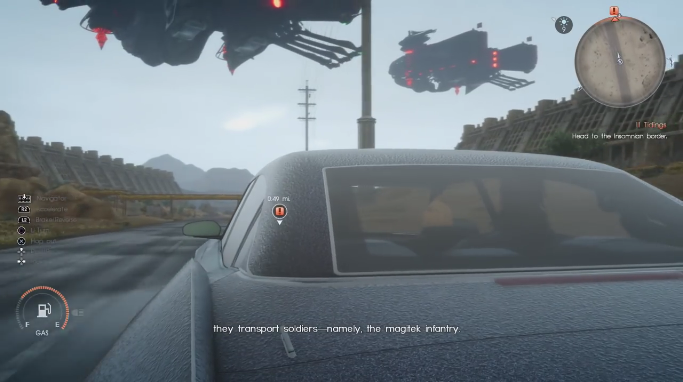 The cutscene will show that while Noctis and his party were away, the Kingdom of Lucis was attacked by the Empire of Niflheim. The signing of the peace treaty was only a ruse to disguise the empire’s true intentions of taking Lucis by force. Emperor Idolas Aldercapt, aided by his ruthless general Glauca, begins an assault on Insomnia, the Crown City. 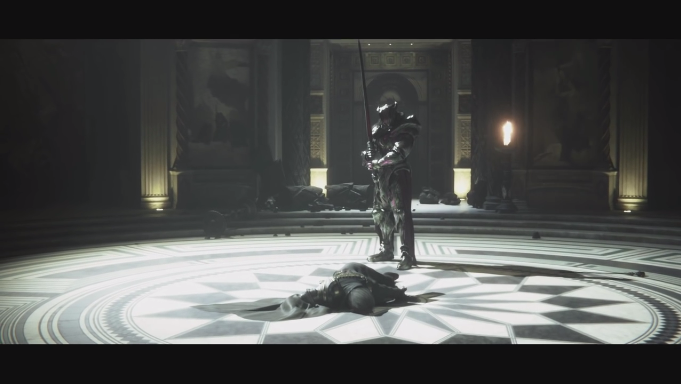 Defending his kingdom to the bitter end, King Regis dies by General Glauca’s hand. Word of the tragedy soon reaches Noctis and his party during their stay at the hotel in Galdin. Reluctant to believe the news, they then decide to head back to the Crown City to see it with their own eyes. On the party’s way back to the Crown City, they catch sight of Imperial Dreadnoughts — transport ships used by the Empire of Niflheim — to transport magitek infantry in their campaign. After reaching a dead end, the party decides to take a detour to get a better view of the city. As you enter the area, you will spot Imperial Riflemen. Before they notice you, get into position and execute a surprise warp-strike. Take them out by mixing up warp-strikes and your allies’ techniques. If they manage to surround you, use a greatsword to damage them all simultaneously. 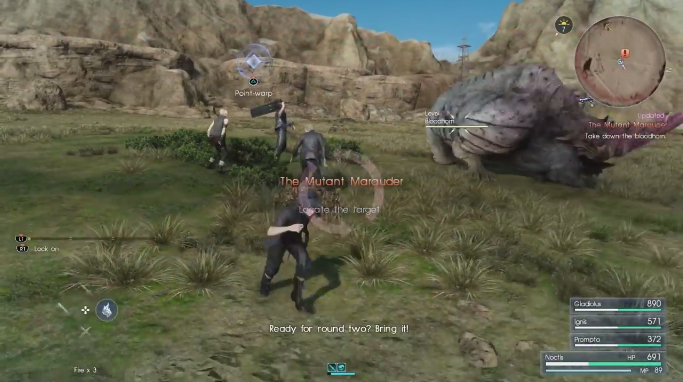 Gladiolus would be especially useful against them in groups so command him to use his techniques as often as you can. Continue following the quest marker and you will again encounter a group of Imperial Riflemen. There will be a point-warp up ahead so be sure to recover once your HP and MP are low. This is also good for somehow avoiding enemy fire as they are quite spread out this time. Take them out and continue deeper into the area. 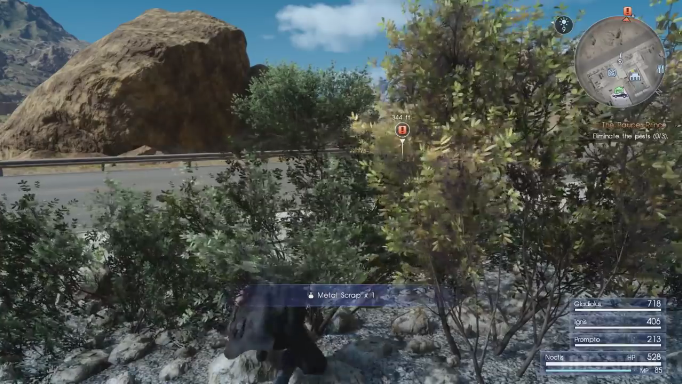 You will then come across another group of magitek infantry. This time, there will be an Imperial Sniper. Be sure use warp-strike to quickly close the distance. Two Imperial Axeman will also appear. Be sure to use quick evasive maneuvers like dodging and warp strikes to pop in and out of the fray as you will be be surrounded. A good tip is to take out all ranged enemies first, then focus on the Axemen. It is also likely that one or more of your allies will be knocked out and will be in danger. Quickly assist them by hitting L1 to rescue them. 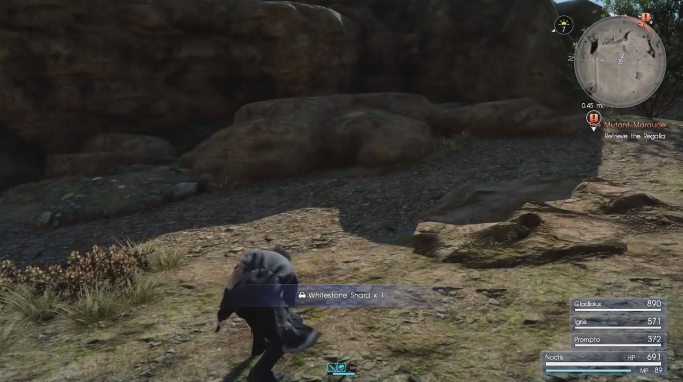 Pay particular attention to Prompto as he has the lowest HP in your party. Further along the path, there will be more Imperial Snipers so be sure to have enough MP for warp strikes. An enemy may occasionally drop 1x Drain Lance. Weapons marked with a + can be remodeled by talking to Cid back at the Hammerhead Garage. Head to the peak overlooking the Crown City. A news report on Prompto’s phone will confirm what has happened to the city, including the fate of Lunafreya and the king. Noctis will contact Cor Leonis to find out what really transpired as Imperial Dreadnoughts fly overhead toward the city. 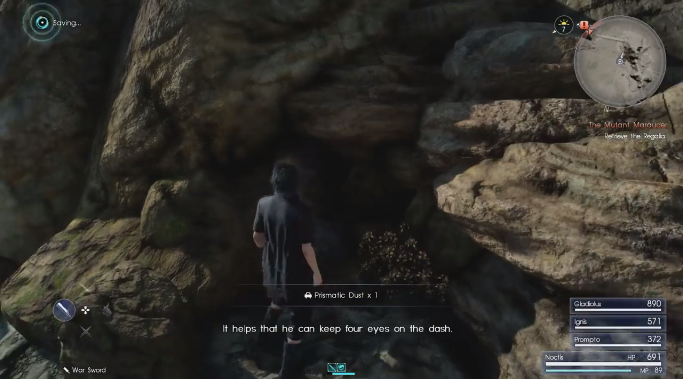 Cor will tell Noctis that the news is true and that his father is dead. Devastated, the party agrees to go back to Hammerhead outpost and meet Cor there. This concludes the walkthrough for Chapter 1 of the game.